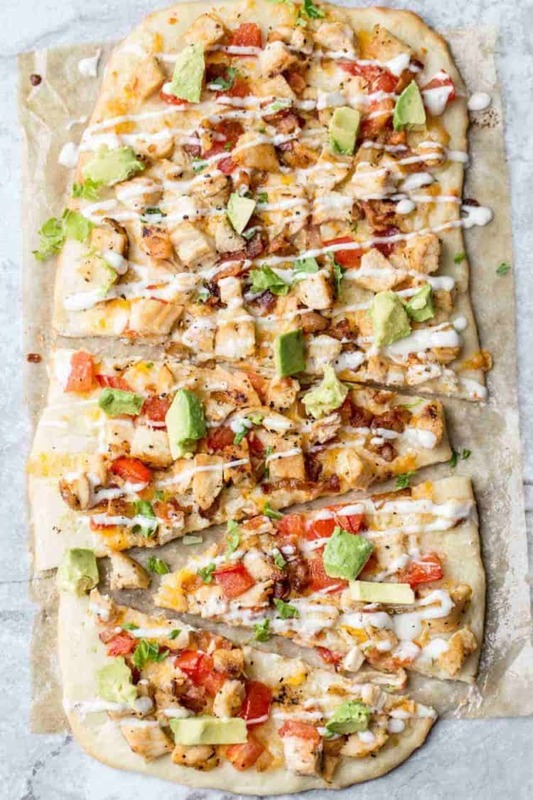 This Avocado Chicken Flatbread Pizza is the ultimate recipe when craving thin crust pizza using homemade dough. 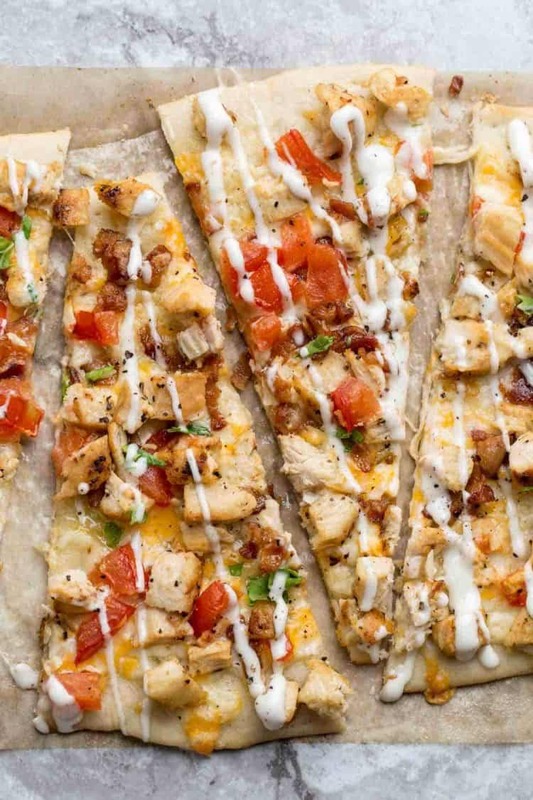 Thin and crispy flatbread crust topped with cheeses, chicken, bacon, avocado and drizzled with Ranch. Whether it’s Chicken Alfredo Flatbread (using the same dough), or the Mushroom Flatbread using a store-bought crust, flatbread pizzas make for a wonderful light meal! I just love this homemade flatbread pizza recipe! 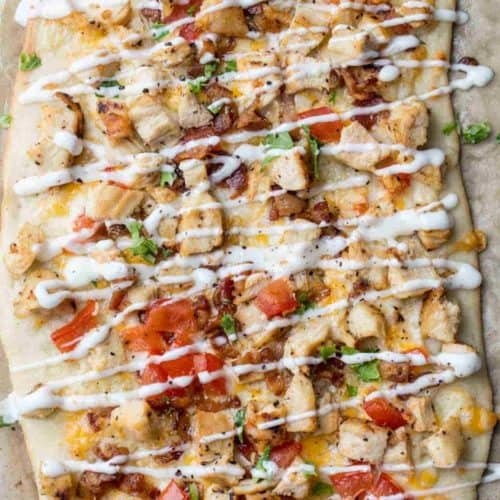 Thin homemade flatbread crust topped with mixed cheeses, bacon, juicy chicken, avocado, and drizzled with Ranch. The crust is thin, crispy and crunchy and has fewer calories than classic pizza dough, WINNER! 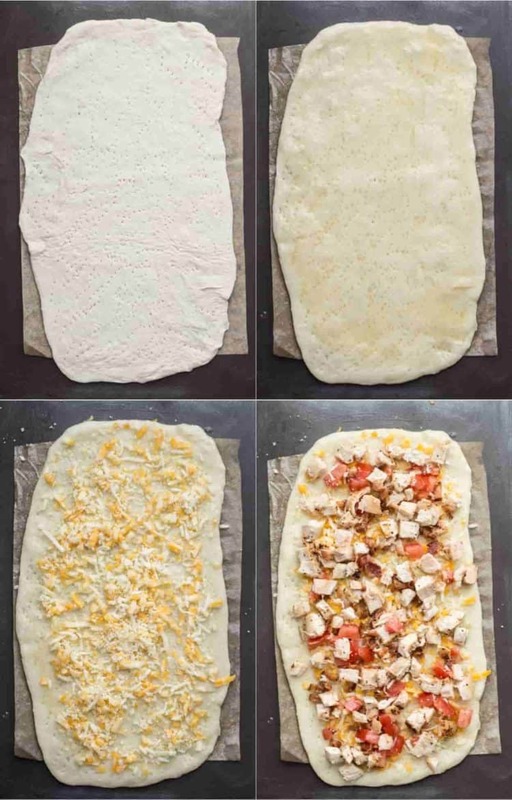 You can add different toppings or sauce to the flatbread if you’d like, there’s no limit to the different variations of flatbread you can create. Serve flatbread with my favorite BBQ Chicken Salad! what’s the difference between pizza dough and flatbread dough? Flatbread dough is made with similar ingredients as regular pizza dough of water, flour, yeast, oil and salt. The only difference is between the two is that the flatbread dough is rolled out thicker and is crispier than pizza crust. Making homemade flatbread dough at home is so easy! Once baked, the crust is thin, crispy and so good! In a bowl, add the warm water. Add the sugar, oil, yeast and salt. Mix to combine. Cover and allow yeast to activate about 5 minutes. what toppings can I add to flatbread pizza? You can use a combination of your favorite cheeses. Mozzarella, Colby Jack, Swiss, Mexican or four cheese will all work. can flatbread dough be frozen? UNCOOKED: Yes, the dough can be frozen uncooked once it rises. Place in container bag or Ziploc bag and dust with flour to keep from sticking. Will stay fresh up to 3 months. Thaw completely before using, best if thawed in refrigerator overnight. COOKED: This dough can also be frozen once you bake it the first time around. Allow crust to cool and freeze in a freezer bag, thaw and continue with recipe. To reheat flatbread, place in oven or toaster oven at 350°F for a couple of minutes, until reheated. Yes, this flatbread would make for wonderful crust if grilled. Bake initial dough without toppings in the oven. Then once all the toppings are added, grill the flatbread lined with foil so the crust doesn’t burn, allowing the cheese to melt. Low Carb Keto Pizza Crust– with only 4 ingredients! Chicken Quesadillas– so simple, ready in 10 minutes. Avocado Tuna Sandwich– the avocado is so good with the tuna. Philly Cheese Steak Sliders– always a hit at parties. Don’t forget to leave us feedback in the comments below if you make the recipe. 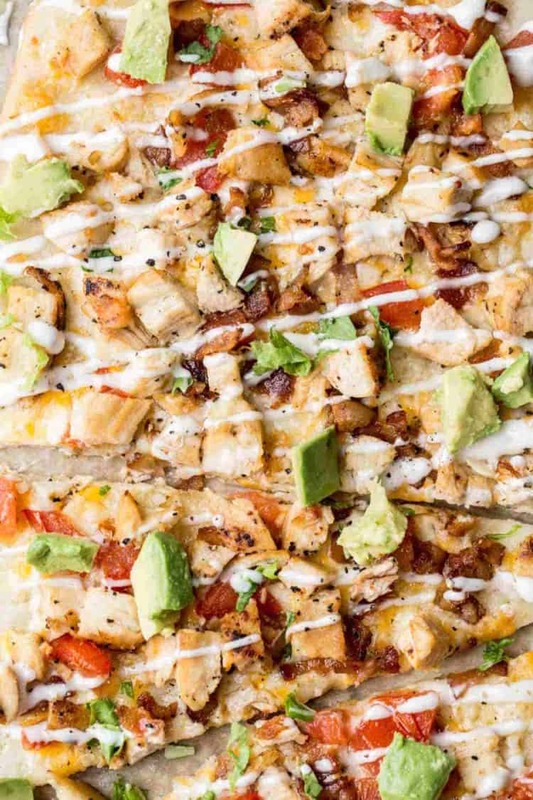 Amazing recipe for avocado chicken flatbread pizza. 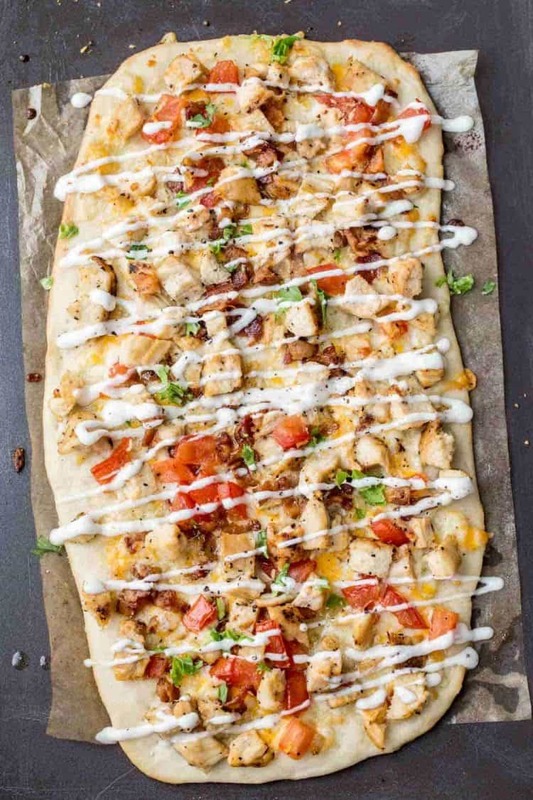 Homemade flatbread pizza dough topped with cheese, cooked chicken, bacon, tomatoes, avocado and drizzled with Ranch. SO GOOD! Place the warm water, oil, salt, sugar and yeast in a bowl. Whisk to combine and allow yeast to activate. Cover the dough and allow to rise for one hour. With a fork, poke holes in the dough and bake at 375°F for 12 minutes. Melt 2 Tbsp butter and mix with garlic powder. Brush over flatbread. Beat chicken breast until even in thickness. Combine ingredients for the seasoning. Season both sides. On high heat, heat 1 Tbsp oil in a skillet. Sear chicken 2 minutes on both sides. Turn heat down to low, close lid of the skillet and cook another 5-6 minutes, until chicken is tender. Once cool, cube chicken breast into small bite-sized pieces. In a bowl, combine all cheeses. When flatbread is cooked, top flatbread with cheese. Add cooked bacon, chicken, and tomatoes. Cook an additional 15 minutes. Top with avocado. Drizzle with Ranch before serving. This flatbread pizza was inspired by BJ’s Restaurant and Brewhouses’ California Club Flatbread. Thanks for the great idea will definitely do that! Favourite pizza for sure! !